Bird of paradise is an evergreen flowering perennial native to Southern Africa. The flowers of the plant resemble the head of a bright tropical bird, hence the name. Bird of paradise is widely grown in warm and tropical areas, but can be grown indoors in cooler climates. 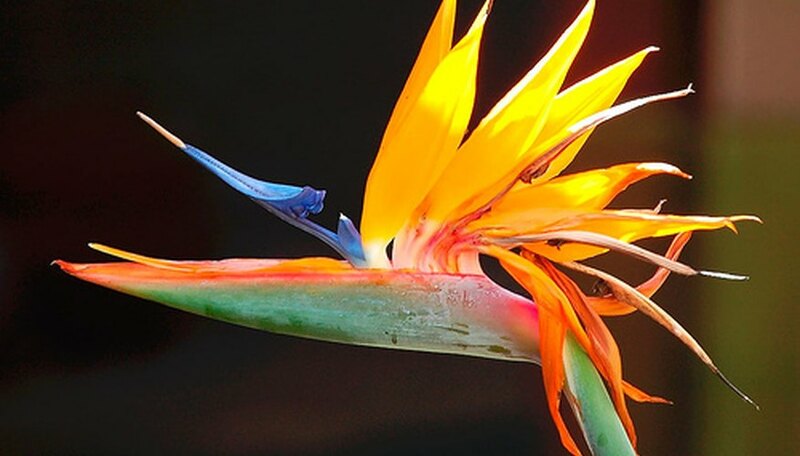 In the garden, bird of paradise can grow quite large–up to 5 feet high and 5 feet in width. It's an impressive addition to any garden, and is quite easy to maintain, particularly for a tropical plant. Plant bird of paradise in fertile, well-drained soil in an area that receives full sun to light shade. Plant in a hole at least twice the diameter of the root ball, and space plants at least 6 feet apart to allow room for growth and flowering. Make sure the top of the root ball is even with the top of the soil when planting. Water bird of paradise immediately after planting to compact the soil, and then at least once per week during the growing season or anytime the soil feels dry to the touch. It's important not to allow the soil to become too dry or too soggy, especially during the first six months. Consistently moist, but not wet, soil conditions are ideal. Water once weekly during the winter to encourage blooming the next summer. Place a 2- to 4-inch layer of mulch around the base of bird of paradise plants to help conserve moisture and stabilize the root temperature. Keep at least 2 inches of ground around the stem of the plant clear, as mulch against the stem can contribute to the formation of stem rot. Fertilize bird of paradise plants once every three months using a balanced slow-release fertilizer. Refer to the manufacturer's instructions for proper dosage and application. As a general rule, spread about 1 lb. of fertilizer per plant on the ground above the roots, but always check the directions on the packaging to avoid over fertilizing. Remove any dead or damaged leaves and spent flowers or stalks as soon as possible. This will not only improve the appearance of the bird of paradise plant, but will also prevent possible fungal infection from organisms living on the dead plant tissue. Snip the leaves, flowers and stalks as close to the main stem as possible using pruning shears. Bird of paradise plants grown in partial or light shade will grow taller than those grown in full sun, and they'll produce slightly larger flowers and darker leaves. In full sun the plants will be smaller and the flowers borne on smaller stalks, but more blooms will be produced. Bark mulch, grass clippings, straw, pine needles, wood chips and leaves can all be used as mulch for birds of paradise. Bird of paradise can be grown indoors in areas where the temperature drops below 50 degrees F. Plant in a container and bring inside during the winter months. All care instructions are the same for indoor birds of paradise, although mulching is not required.